Jenny became the Minister of Faith Development on Sept. 1, 2014. She is originally from Kitchener, Ontario but is happy to call Halifax home. She is engaged to Charlie and is looking forward to a 2019 wedding. In her free time, Jenny loves to work on crafts, row in her dory, and hike the beautiful trails of Nova Scotia. Jenny works primarily with the children and youth and helps to nurture faith for the whole family at FBCH. She believes all ages can grow together and learn from each other. Jenny also serves the Baptist Chaplain at Dalhousie Multifaith Services. You can find her on the 4th floor of the SUB (Student Union Building) room 407, Thursdays from 10am-1pm. Chaplains offer support to students and staff who are wrestling with life decisions, faith struggles and connecting to other support systems. Feel free to make an appointment or drop by. 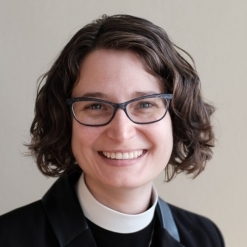 Jenny has a Bachelor of Religious Education from Emmanuel Bible College and a Master of Divinity with a concentration in Religious Education and Pastoral Care from Waterloo Lutheran Seminary.